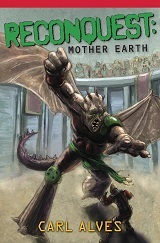 Reconquest: Mother Earth tells the tale of an Earth that has been taken over by alien beings with 90% of the human population killed. The remainder are put to work as slaves, mostly mining for rare earths, or try to scrabble out a living out of sight of their new masters. Mitch Grace, a Navy SEAL during the initial invasion, is almost killed, but wakes up from a coma five years later to discover what has happened. He takes it upon himself to start a war to kick out the conquerors and regain the planet. The author is a pretty talented wordsmith. He is able to clearly convey ideas and scenes. His timing is good, and the flow of the narrative works well. I think his greatest strength is his dialogue, which is one reason why his characterizations are so strong. He shows us rather than tells us. A few characters shift from a somewhat negative initial impression into being quite admirable and likable. This shows a depth that is often lacking in other books. Copy editing and proofreading were satisfactory. Content editing and fact-checking, however, were not good. The book made heavy use of military, yet there were numerous errors of fact concerning all aspects of it. A decent editor or fact-checker would have caught those, and as most had really no impact on the storyline, they could have been easily fixed. This is a fast-paced, action-packed book. Some readers will be bothered by the mistakes in it, but if you can get beyond that, what you have is an enjoyable thrill-ride, a dystopian/space opera hybrid that should please most readers.